Located at one of the most prestigious prep schools in CA, The Cate Sports School adidas Tennis Camps features 8 tennis courts, indoor gym, community center that has ping pong, pool table, and foosball tables, as well as a pool for our campers to use. Located a few hours outside of LA, The Cate School is the perfect spot for summer fun. Check-In: Overnight Campers check in Monday 9-9:30am. Day and Half day campers check in 9:30-10am. Following the first day, Day Campers are expected to arrive at 8:45AM. Day Camper Pick-up: Day Campers are to be picked up each day at 5pm at the tennis courts. Half Day Campers are to be picked up at 12:30pm. Check Out: Parents are invited to attend the match play tournaments that begin at 9:00pm on the final day. Check-out for ALL CAMPERS will take place at 12:00pm at the tennis courts. The nearest airport is LAX Airport in Los Angeles, CA. You are responsible for getting yourself to and from campus, adidas Tennis Camps does not provide transportation. 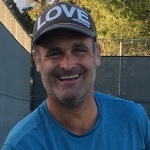 Chris McBride is an assistant coach at SBCC and owner of McBride Tennis Instruction. He is a PTR teaching professional with a wide range of certifications. He is currently a head pro teaching for the City of Santa Barbara. He has taught in Vancouver, Canada at the Jericho Tennis Club and locally at Knowlwood Tennis Club. Chris grew up in Vancouver, Canada where he was a ranked junior. Teaching, coaching and learning has been a life-long passion. Chris is graduate of Santa Barbara City College, earning his AA degree before earning a B.A. in Psychology from UCSB. He also received his Masters in Education from Columbia University, was an elementary school teacher, and owned and taught at his own yoga studio locally.